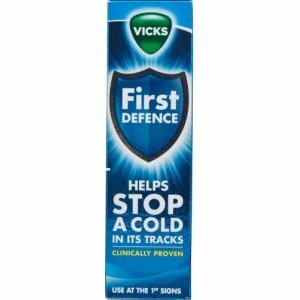 Vicks First Defence Micro-Gel Nasal Spray fights cold germs before they can take hold: When used at the first signs of a cold. Cold viruses attach to the cells at the back of the nose via surface receptors and stat invading the cells. The viruses multiply to such an extent that the body's immune response launches. You experience the first cold symptoms (such as a tickle at the back of the throat or sneezing). The viruses continue to multiply and spread. The symptoms further develop. The infection develops into a full blown cold, leaving you with all the bothersome symptoms. 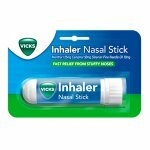 How First Defence Nasal Spray works: When used at the 1st signs of a cold, First Defence nasal spray acts at the back of the nose directly where the cold virus takes hold and starts to develop (that's why it is a nasal spray). 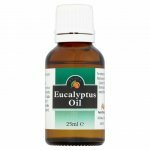 It traps, inactivates and helps your body naturally remove the cold viruses, to reduce the risk of the initial infection developing into a full blown cold. Trap: The unique micro-gel formula traps the cold viruses that start to develop at the back of the nose and helps prevent them from developing and spreading. Inactivate: The micro-gel reduces the pH of the nasal cavity and inactivates the viruses, reducing their ability to multiply and further infect you. Remove: Then, it flushes the nose and stimulates natural secretion (one of the body's natural defences in the nose) to help naturally remove the inactivated virus (toward the stomach or by blowing one's nose). 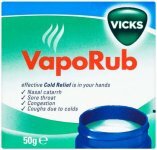 Start to use as soon as feeling the the first cold symptoms (e.g. a tickle at the back of the throat or sneezing), before the cold has fully developed. You can even start using it when feeling at risk of catching a cold. When using First Defence: you may experience increased nasal discharge (runny nose) or temporary stinging. These are normal sign that the product is working. They not harmful to heath and will not last for long. If the sensation persists stop using the product. In the case of accidental contact with eyes, flush with water and seek medical advice straight away. 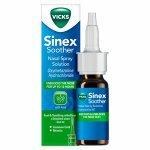 Vicks First Defence Micro-Gel Nasal Spray Ingredients: Aqua, Hydroxypropyl Methylcellulose, Succinic Acid, Disodium Succinate, PCA, Phenethyl alcohol, Zinc EDTA, Zinc Acetate, Polysorbate 80, Aroma; (Menthol, Camphor, Eucalyptol), Sodium Saccharin.